Friends are the water that keeps the wheel turning. We are an independent voluntary group who relentlessly promote research, conservation and celebration of the Springs, Spouts, Fountains and Holy Wells of the Malvern Hills and of Great Malvern as a Spa Town. Timing - 11am to lunchtime Thursday 21 Feb 2013. Location: The Courtyard at 10 Belle Vue Terrace by the Bottling Works Spring. The occasion will celebrate the improvements to the Bottling Works Spring and the new Courtyard Fountain, together with the shops and refreshment facility. Free coffee/tea and canapes etc will be served to those attending. Malvern Museum are providing light musical entertainment with the historic dulcitone, once played by Blind George Pullen at St Ann's Well. The presentation of the Award will take place in the form of an unveiling of the plaque already in situ by Mr Jim Fox, Head of Corporate Affairs, Coca-Cola at about 11.45. We came across this fountain recently in Sussex. It dates from 1865 when it was donated by local resident, Mrs Elizabeth Cunningham. Originally it was located in the middle of the road in Seaside, the road that leads out of Eastbourne town centre towards the Pevensey Marshes. The road was known as the place where you could always pick up a little smuggled baccy or liquor. 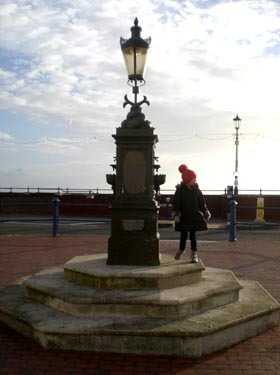 During the 1950s the fountain was removed to the side of the road and eventually re-sited and restored in its present position, on the nearby sea front, in 2000. What is particularly interesting is that it includes similar biblical quotations as the Ellerslie Fountain in Malvern. 'Jesus said that whosoever shall drink of this water shall thirst again' and 'Jesus said whosoever drinketh of the water that I shall give him shall never thirst' (St John IV 13,14). Also like Malvern it was lit by a gas lamp. What Malvern lacked was the smuggled baccy and liquor. Bertram Hughes started out as a water diviner with his father, then set up his own business. When his father retired, Bertram went in with his old school pal Arthur Quinney. In 1950 he handed the business over to Arthur when he took up a contract with the Crown Agents working in Gambia as a dowser. 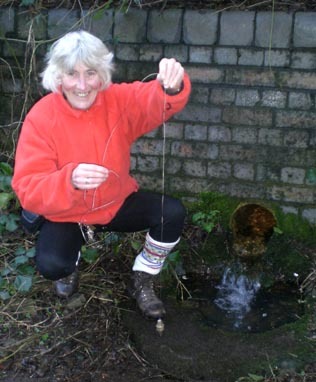 The skill of the dowser was to determine the depth of the spring and the flow rate of water. If the well was for a farm with high water usage, the water table chamber would have to be of a size and depth so that at peak demand the water level would not drop to a point where they would be pulling up sediment. Picture above - Malvern's 21th century diviner using a pendulum. The difference between water diviner and dowser is that a water diviner finds just water whereas a dowser finds mineral deposits as well, plus a lot of things that have never been put down on paper. The equipment used was a hazel twig in the shape of a Y type fork for water diving and whale bone for dowsing. Some now use copper rods but they do not have the sensitivity you get from whale bone. In our last newsletter we reported on a fountain in Newport, Isle of Wight. 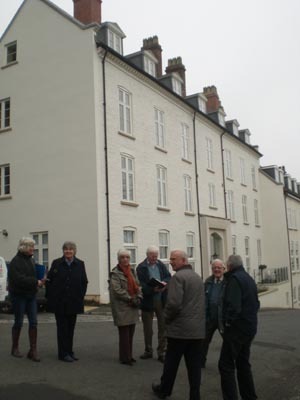 It had suffered vandalism and neglect and had at last received a sheltered new home and a restoration programme. Nicknamed the Wandering Fountain because of its many former locations, we were advised by a Friend that it was now in a new position on Newport Quay. We now learn from a press cutting from the County Press sent by our Friend, that the fountain has its lost basin replaced and the water is flowing. This is a good example of local cooperation and effort producing a great result. Valuable archive material secured for posterity. Last winter Cora and Bruce were made aware of an important archive of spa material that was being disposed of. It covered the second half of the 20th century and was the personal property of a person of note previously active in the British Spas Federation (BSF). The BSF existed from the late 19th century through to 2004. It was a consortium of major spa towns and included Malvern. Anxious that this rare archive material should not be lost, we agreed to drive north on a wet winter's day and collect the assortment of books, reports and paperwork. The mission was accomplished just before Christmas and the two large boxes of material promised to be a major research resource. 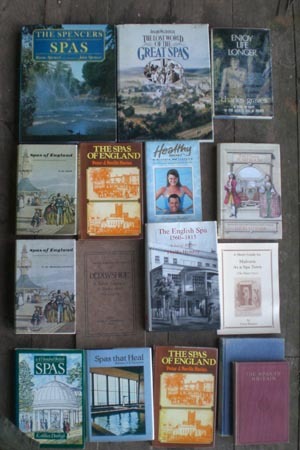 Since then we have sorted out what we have and it comprises a collection of spa related books and brochures, which, because they duplicate those in our own collections we are happy to dispose of. Of much greater interest to us are the reports and other paperwork dating back to the late 1950s. This includes copies of meeting minutes, spa tourism development reports and proposals and historic data on the member spa towns. There are even documents recording in detail the number and type of spa treatments given under the National Health Service during the 1960s. Reading through the material it is apparent how the whole ethos of the spa in England has changed. No longer is a spa seen as a branch of orthodox medicine. Today the spa is very much orientated to healthy leisure and pleasure. There are some interesting details on Malvern and we will be utilising these in due course. In the meantime, if there is a Friend who would be interested in acquiring this collection of spa books as illustrated, please contact Cora or Bruce. The history of the British Spas Federation can be read on our web site by going to www.BritishSpas.co.uk We have updated this paper as a result of the new information emerging from the recently acquired archive. In 2007 a Friend gave us a bottle of Elsenham sparkling water. The 750 ml. bottle gives further details; 'bottled at Elsenham, Herts from a confined aquifer'. With all the current interest in Malvern Waters being bottled and having never heard of the Elsenham brand at the time, our investigation team set about researching the background and here is the story. Elsenham water is sourced from a borehole drilled in 1890 for local water supply. 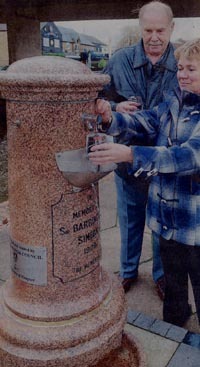 The borehole fell into disuse in 1960 and was rediscovered in 2000. The aquifer is in chalk producing a calcium bicarbonate mineralization. Launched in 2005, Elsenham bottled water sold for about thirty pounds a bottle. The plant could produce about 1000 bottles a day from the artesian borehole. Three staff were originally employed in the purpose-built factory, which included a public water cafe. Available internationally, the price put it into the very top echelon of premium priced waters. Malvern Holy Well water continues to be bottled as a table water and it is encouraging to know that the market continues in spite of our double dip recession. The now defunct Schweppes brand did much for establishing awareness for the Malvern Hills and bottled waters are an important aspect of making available Malvern springs and wells waters beyond the hills. Maybe we should now be looking at the springs and wells of Elsenham as a tourism initiative for the future? 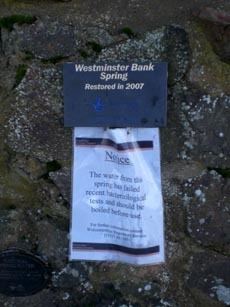 Earl Beauchamp's Fountain has had a water contamination notice attached to it for some weeks this winter and so has Westminster Bank. Following bacteriological testing the water needs to be boiled before use. Earl Beauchamp's Fountain is a popular water fill up point and the notice raises many questions. One reason for this contamination is likely to relate to the recent heavy rainfall this winter. Ground and surface debris is washed into the spring and will include animal faecal deposits. This underlines a problem with all surface springs: how do you prevent the ingress of local surface water that will possibly contaminate the source? The answer is of course to have a deep underground source, isolated from surface water. Here we have a problem that confronts most Malvern springs and wells. They are essentially surface water that has penetrated the rock only to re-emerge down slope. The other alternative is to arrange for bacteriological sterilisation of the water by UV lights. This is impractical for many sources on The Malverns. Flowing water is generally less likely to be severely contaminated than static water, which works to advantage with our springs and wells, but sudden rainfall can wash in ground contamination especially after a dry period. The answer for those who collect water is to concentrate on well-established sources that are tested from time to time, although even testing only identifies what is present at the time of testing, not 5 minutes afterwards! Perhaps technology could provide the answer with some sort of instant test kit - let us know if you have any ideas. 'Malvern' springs up in many different countries. There are six in the USA, two in South Africa, and one each in Jamaica, Barbados and New Zealand. To add to the two already in Australia (Adelaide and Melbourne) a third, Malvern Springs, is being built at Ellenbrook, Western Australia. Ellenrook is on the outskirts of Perth and lies to the north east of the city. Its advertising brochure insists that, 'Malvern Springs will be, quite simply, a better place to live. Our new village is named Malvern, derived from 'Maelfern', the Celtic name of a spa town on the Welsh/English border renowned for its great natural beauty, national park hills, and natural mineral springs. 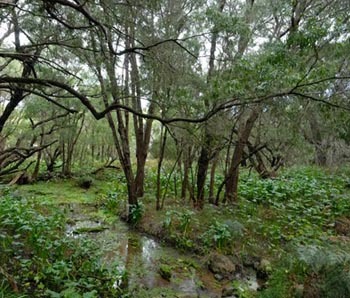 Picture: In the wilderness at Ellenbrook, surface water is seasonal depending on rainfall. Cora has been corresponding with a researcher in Fremantle, Western Australia, on the subject of compressed air chambers, who added, 'Ellenbrook is a new subdivision around an hour and a half north of Perth. It's a very sandy hot area...' Malvern lives, grows and reproduces but, like people, we wouldn't expect to find another Malvern quite like ours. A Friend Advises - How do you make holy water? Boil the hell out of it! The home page can be accessed by clicking website above. Newsletter Archive which can also be accessed from our WEB SITE INDEX. Friendship - There is no charge made for joining Friends of Malvern Springs and Wells. Just let us have your email address and we will send our newsletters, which are usually two monthly. Please be aware that some email addresses block large circulation emails. Do feel free to participate in our activities by contacting us below.